I don't recall any details of the intramuscular injection I gave today. That's a stark difference to the first IM injection I gave in nursing school back in the 80's. I recall the patient was a nun with a warm disposition and that put my nervousness at ease. I'm sure I swiped the alcohol swab far and wide and examined the needle bevel with intimate detail. I definitely didn't do that today. I did the basics. Because it wasn't a novelty, I didn't bring the same quality of attention to it as a newbie. In fact, I often go through my day, proficiently delivery nursing care with a lack of mindfulness. This is a luxury that comes with experience that most nursing students long for. This month I am the host of Brittney Wilson's blog carnival on one of my favorite topics: Bringing mindfulness to the bedside. I was tempted to reinvent the wheel but decided to repost this helpful list from last year. 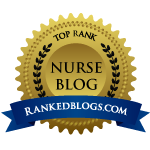 At the end of the blog you will be invited to read other perspectives on this topic from other nurse bloggers. It is only when we begin to practice mindfulness that we are even aware of how un-mindful we are in our day to day lives. I imagine you have become proficient at your commute and there are days you can't remember any details of your drive, yet you managed to get to your point of destination. Even though I teach mindfulness meditation, sometimes I find it challenging to be mindful in my daily life. Life is busy and there never seems to be enough time to get everything accomplished. The hospital environment adds other dynamics that can make the day feel overwhelming with the cumulative effects of alarms, call lights, phone calls, time consuming charting, technologic glitches, communication difficulties, bureaucracy and oh, patient care. In the fifteen years I have been meditating, I've learned a thing or two. One insight I've learned is that it's a hell of a lot easier to be mindful on the cushion at a silent retreat than it is in the midst of a busy nurses' station. Imagine a hospital of mindful health care providers. You may say I'm a dreamer (as John Lennon was) but I'm not the only one. Imagine the effects on patient care, on communication with co-workers. Imagine the reduction in medication errors if we all practiced a little bit of mindfulness. Lately, I've been on a secret project of picking one thing a day to be mindful of at work. I ask my mindfulness students to do the same. Keeping it simple makes it tangible rather than some overzealous, unachievable goal of being mindful every minute of the day. 1. Sitting in my car for five minutes before heading into work. I focus on one aspect of my breath, whether it be the air entering my nostrils, following the breath down into the belly or the rise and fall of the chest or belly as I breathe. I sometimes say to myself, "Breathing in, I'm aware that I'm breathing in. Breathing out, I'm aware that I am breathing out." Seems obvious but it adds another layer of attention so my mind doesn't wander off. 2. Take a conscious breath before opening the door to my patient's room. This allows me to be present in a different way than if I am rushing around. If it is possible, I try to be especially present for the first few moments that I meet the patient. Who knows what kind of chaos the day will bring but I can at least start out with a strong intention. Supposedly it takes seven seconds to make a first impression. If I can use those seven seconds to allow my patient to feel cared for, he or she may feel less anxious and may have a positive impact on my day. 3. Pause and take a breath before answering each phone call. Despite calling California home, my New York roots run deep. We communicate minimally and efficiently but not always pleasantly. Visit a NYC supermarket and see how chatty the checker is. I became aware of this watching my co-worker from Tennessee. No matter how urgent the situation was, she often seem mellow and polite in her phone exchanges. By bringing some mindfulness in to a simple act of answering a call, it can slow my speech and actually have a calming effect…that is until the content of the call throws it out the window. 4. Pause and take a breath at the Pyxis. I have to wait for the machine to recognize my fingerprint, so why not calm the mind, take a breath and be extra clear administering medications? 5. When I'm feeling up for a bigger challenge and want something that occurs frequently through my day, I bring mindfulness to the doors. Every time I twist a doorknob, enter a code, swipe a badge or tap the metal button on the wall, I bring mindfulness to the act. I bring my attention to the coldness of the metal, the texture of the buttons, the movement of my wrist, the sounds of the beeps or the tap. All of these simple little tasks are ways of bringing mindfulness into our busy day at work. Before I started doing these things, I could go a whole shift without ever being aware of my breath. Fortunately my reptilian brain is intact and can function on automatic pilot but my mind and emotional state feel a hell of a lot calmer when I'm aware of my breath and my stress level. From The Straight A Nursing Student: we learn about being tidy. From Yoga Nurse: we learn the ABC's of mindfulness. From Minding the Bedside: we learn about quality vs quantity. From Elizabeth Scala: we learn how to fit mindfulness into a busy workday. 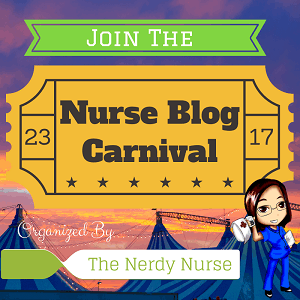 This post was written as part of the Nurse Blog Carnival. More posts on this topic can be found at The Balanced Nurse Blog. Find out how to participate.